Unfortunately, we no longer have the original clipping of this article. It is unknown what happened to it. We do have the typed transcript of the article with handwritten notation at the top. It is also unclear as to whether there was more (another) typed page or if the article ended here or still... went on to discuss other artist at the exhibition. 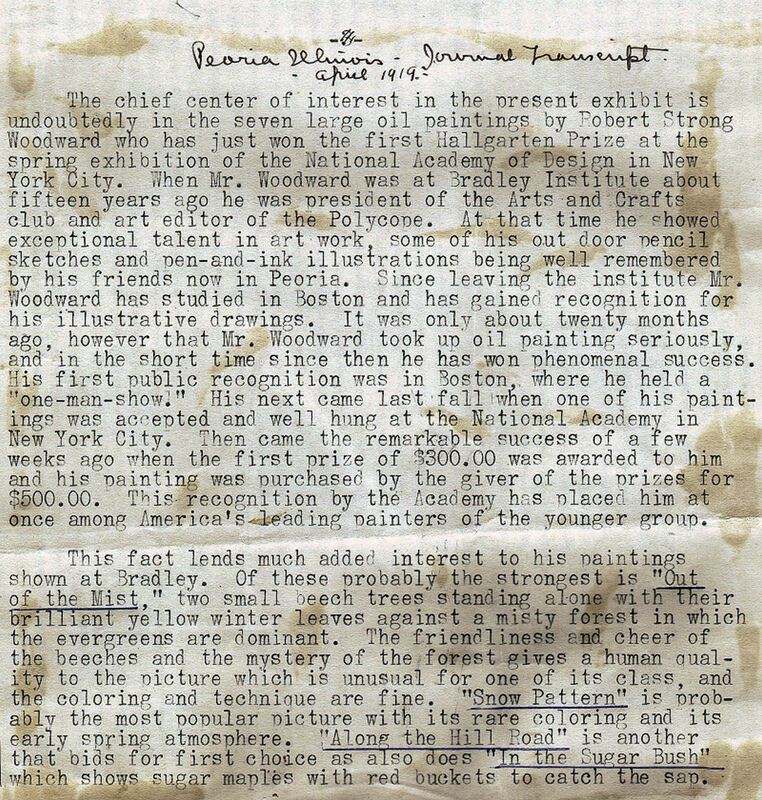 It is safe to say, that after RSW's success in winning the Hallgarten Prize, given to the best artwork by an artist under the age of 35, at the 1918 National Academy of Design Exhibition in NYC, made his return to Peoria a big deal and wonderful 'homecoming' or sorts for the artist who attended Bradley Polytechnic Institute in the fall of 1902, as a high school junior. Three years later, after finishing high school (1904) and two years of college-level study, Woodward joined his parents in California, where he planned to take a gap year, travel to Japen before attend Leland Stanford University. This transcript list reviews of just 4 canvases from the exhibit, however, we know from a previous article in the same publication titled, Arts and Artist, that Woodward sent 7 canvases but we do not know their names.